Students generally are introduced to algebra in their freshman year of high school. If your ninth grader needs additional practice solving for the variable in equations, your might have him or her work through the sample problems below. Answers and explanations are provided. In introductory algebra, students learn about the structure of equations, as well as how to solve equations with one variable. There are three types of one-variable equations: 1-step equations, which require one mathematical process to isolate the variable (x); 2-step equations, which require two mathematical processes to solve for x; and multi-step equations, which require more than two processes before solving for x. Your child's teacher likely can provide you with worksheets that your child can complete at home for extra practice. However, you also can create your own practice equations, using the samples below as models. 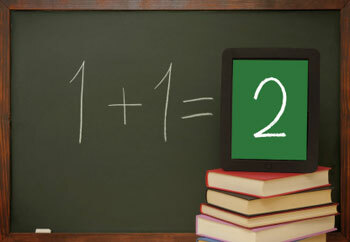 To solve this equation, your child should divide both sides by 7 (21 ÷ 7 = 3 ). The answer is x = 3. To isolate the variable, your child should add 11 to both sides (3 + 11 = 14). The answer is x = 14. To isolate x, your child should first add 10 to both sides (5x = 25). Then, he or she should divide both sides by 5 (25 ÷ 5 = 5). The answer is x = 5. To isolate x, your child should first subtract 49 from both sides (-7x = -35). Then, he or she should divide both sides by -7 (-35 ÷ -7 = 5). The answer is x = 5. 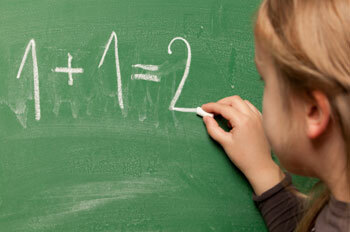 First, the variables need to be combined, so your child should subtract 3x from both sides. The resulting equation should look like this: 3x - 3 = 9. Then, he or she should isolate the variable by adding 3 to both sides, resulting in 3x = 12. Finally, your child should divide both sides by 3 (12 ÷ 3 = 4). The answer is x = 4. To begin, your child should distribute the 2 (2x - 14 = 50). Then, he or she should add 14 to both sides, so that 2x = 64. Finally, your child should divide both sides by 2 to isolate x (64 ÷ 2 = 32). The answer is x = 32.